"Adaumbelle's Quest" welcomes Amanda Eliasch who has lived a life only most can dream about! She's a published author, Fashion Editor for Genlux Magazine in Los Angeles, the British photographer and writer for The Collective Review, a visual artist, a playwright, and a mother, but most of all she is a woman who has taken almost every opportunity that has come her way and did not settle for less than she deserved. 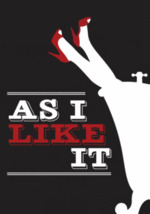 Her auto-biographical play "As I Like" will play the Macha Theatre in West Hollywood, CA from December 29-January 15!